Yes, sweet and savoury versions of daliya (broken wheat cereal) for the husband and wife, both cooked under 10 minutes. Because breakfast should be healthy, filling and delicious always but shouldn't eat up all your morning time. Chuck that packet of instant cereal and see how you can use broken wheat to make 2 versions of healthy cereal breakfast for the family. You can actually make more versions by tweaking any of these 2 recipes of daliya if you have more family members who have different taste buds. Add yogurt or milk, top up with different fruits and nuts, make it savoury by adding a tadka to it or just some leftover chopped salad. Cooked with milk and sugar to taste daliya was a daily bowl of breakfast when we were growing up. I remember my mom would place a large pot of boiling milk on gas stove and throw in some ghee roasted daliya in it. This would cook for about an hour and the result was a scrummy delicious kheer like daliya. I still make that sweet version of daliya but personally I like a savory breakfast, daliya cooked like the south Indian Upma is my favourite. But I do tweak the regular upma recipe to make it healthier and suited for my current weight loss regime. Arvind has also grown up eating that sweet daliya and he still loves it over any savory version so I have devised a simpler way so that he can have his sweet daliya and I can have my savory daliya for the same breakfast. Daliya takes time to cook as it is a completely raw wheat product which is just broken smaller particles. I usually roast the daliya with a tsp or two of ghee (for 500 gm daliya) and keep it in an airtight container for a month or so. About 3 tbsp of daliya is enough to serve two, so I soak the said quantity in water overnight so I can cook it in just 4-5 minutes in the morning. Water should just cover the surface of daliya while soaking. The soaked daliya is then microwaved for 2 minutes, covered, sometimes I steam it in the steamer pot. It gets cooked like couscous, may be a bit sticky but that can be taken care of while cooking further. Now half of this cooked daliya is further cooked with milk and sugar in a larger bowl inside the microwave, or in a sauce pan whatever feels convenient. Then the cooked milky sweet daliya is topped with some fresh cream (malai), some nuts and chopped bananas etc. 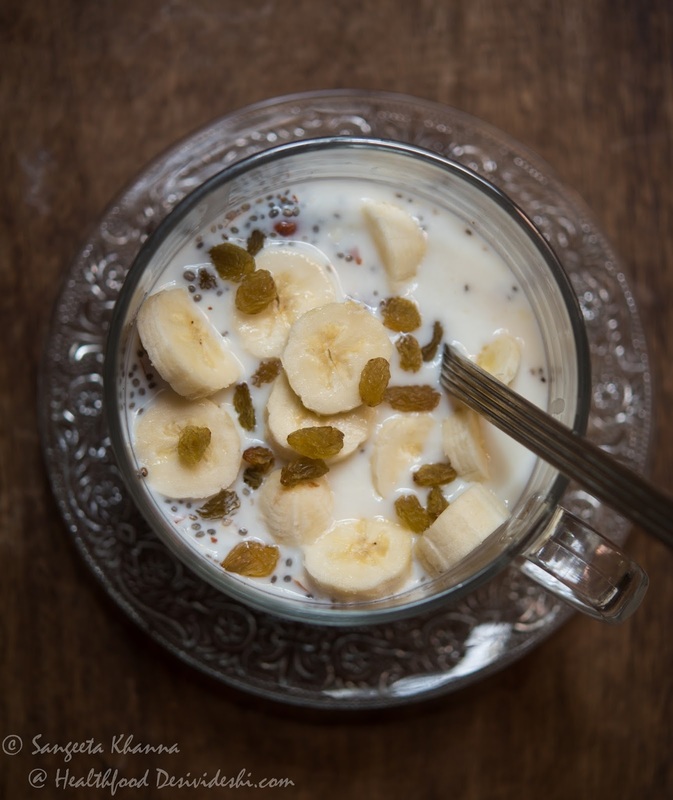 Sometimes flax meal or chia seeds are added to this sweet daliya. This is a breakfast for the sweet tooth. The other half is cooked in a kadai like upma. Heat 1 tsp of ghee and throw in everything except daliya, sprinkle salt over it and stir fry till everything is mushed up a bit, add the cooked daliya and mix well till it looks like upma. Finish with pepper powder and it's ready within minutes. 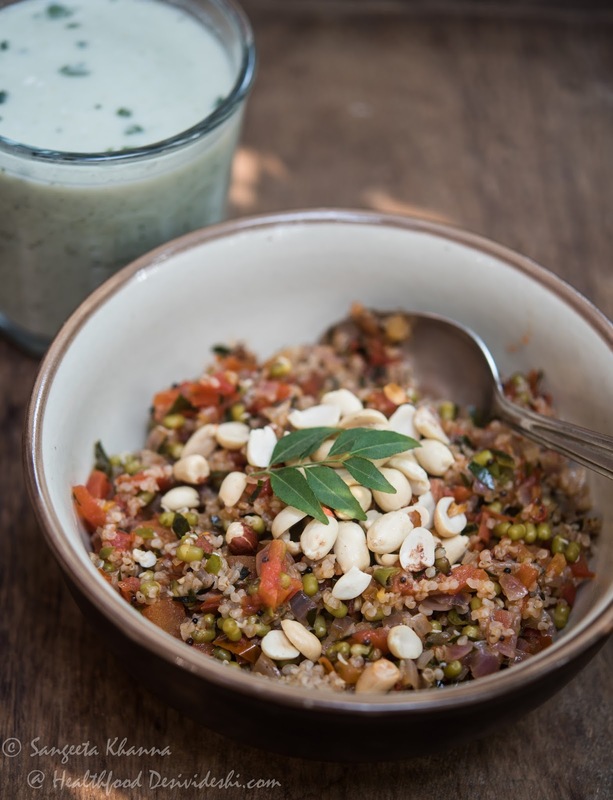 Add sprouted mung and roasted peanuts, mix and serve immediately. Alternatively, all of the ingredients can be mixed together and microwaved for another couple of minutes and the result is almost the same, except the aroma of roasted onions and tomatoes. 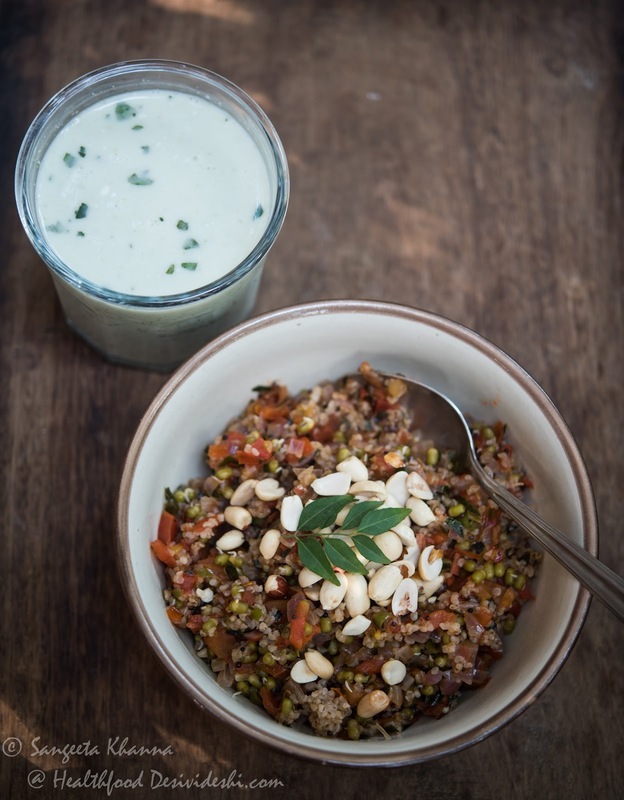 This kind of daliya upma or another daliya tahiri can be served with amla and curry leaves spiced buttermilk. Sometimes we like having these savoury daliya one pot meals for dinner, may be with some raita or plain dahi. Hope you start including daliya in your meals with a smile on your face .... i know many of us have daliya like a medicine and i want to make it a happier meal for all . a good breakfast indeed...Do visit my bog...iam a new blogger!! Adding bananas sounds good. Must try it. Nice presentation. an excellent twist with upma! Love that shot too! A very healthy and yummy breakfast! A healthy and yummy breakfast! I could even have them for the lunch! This is wonderful sangeetha... I like the array of things that u have made with daliya. This is answer to nutritious dinner ideas that i am always short of. only yesterday, i made craked wheat upma. this taste better than oats upma..
@ Devasena... i know oats becomes glue like when cooked for upma , roasting is of little help and the taste is definitely better with daliya. Wow-I've never had a breakfast quite like it! It sounds delicious! Daliya pr broken wheat is said to be very helpful for the diet and very nutritious too.thanks for the sweet and salty recipes...I make both though a little differently will surely try these.